Whenever the name Jamie Oliver comes up, two things pop up in my mind. No, not Naked Chef silly, and no I’m not even talking about cookbooks, rather Jamie Oliver for me is synonymous with “fresh” and “local produce”. I had my doubts about Jamie bringing his restaurants to India. We’re in the middle of food enlightenment in this country and while so much is available, every possible ingredient sadly isn’t being used to its full potential. 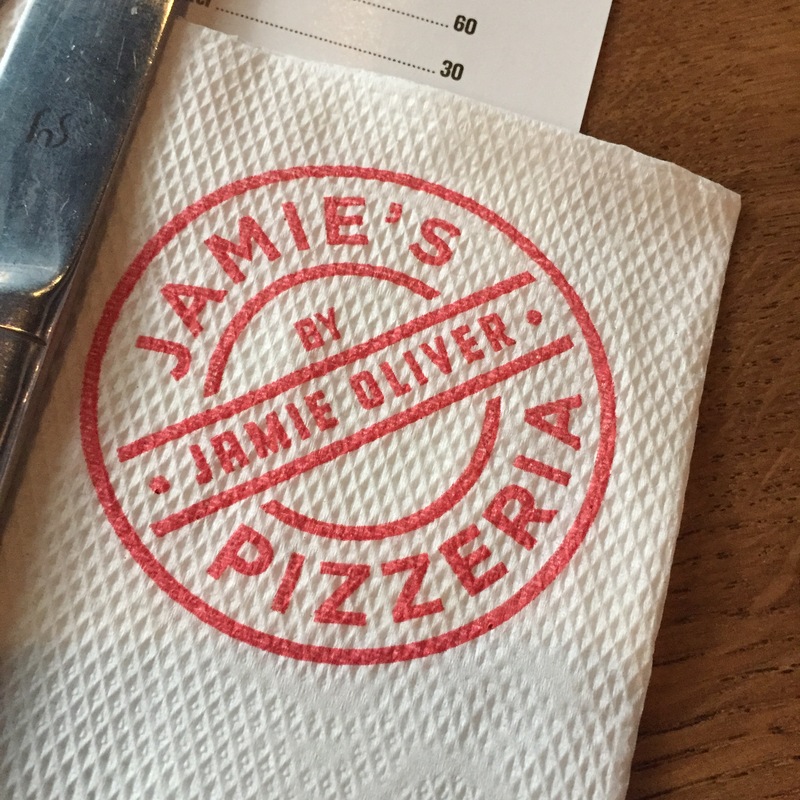 I thought Jamie’s Pizzeria and Jamie’s Italian (I’ve yet to try this one) would be all about the brand and that’s it. I thought it’ll be just expensive dishes that would be good but no different than what we’ve already had available locally. Boy! was I wrong. 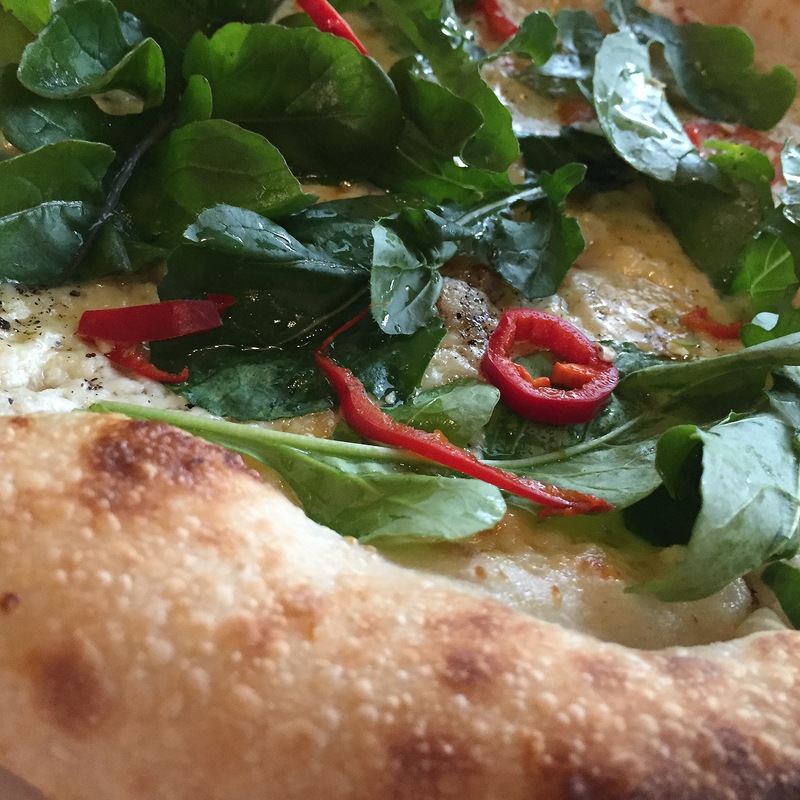 Jamie’s Pizzeria breaks the mould or shall I say pizza base. The ingredients are fresh and this freshness is consistent across everything that was ordered, something I’ve rarely seen at restaurants here. Take the leaves- parsley, mint, and rocket – which were bright and green unlike the half dead darkened ones found on most pizzas elsewhere. At first glance, some might say that there’s a lack of cheese on the base, and that’s a little true, but then that brings out the other flavors of the pizza; mushrooms, rocket, generous helpings of olive oil, red chilies and red onions, all distinct and not just a topping for “toppings sake” but a part of the pizza that adds to the overall essence of the dish. The menu is limited though and once again I’m all for that. I’m tired of places that try to please everyone. 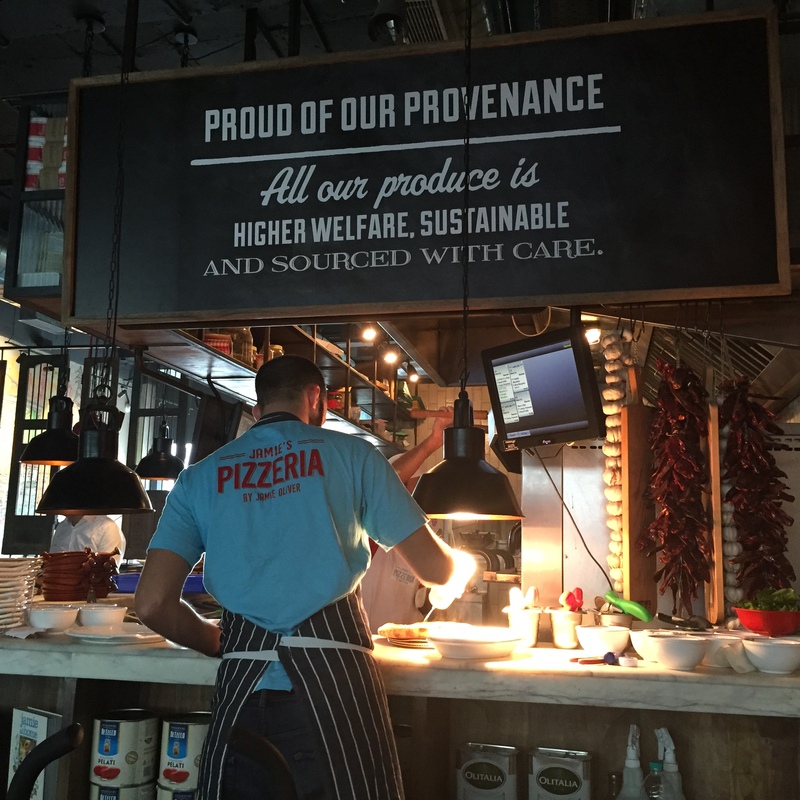 There are pizzas that have specific Indian ingredients and flavors – Paneer, for example – but that’s just adapting to the neighbourhood and using what’s available locally, something that Jamie Oliver is known for. 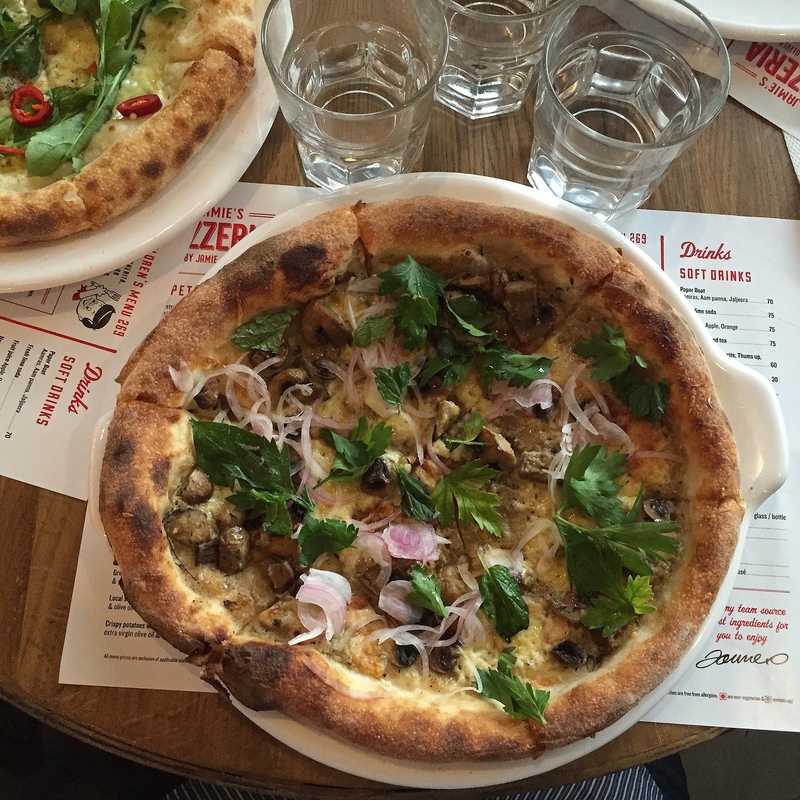 It’s taking the classics to the next level where Jamie’s Pizzeria shows it magic. 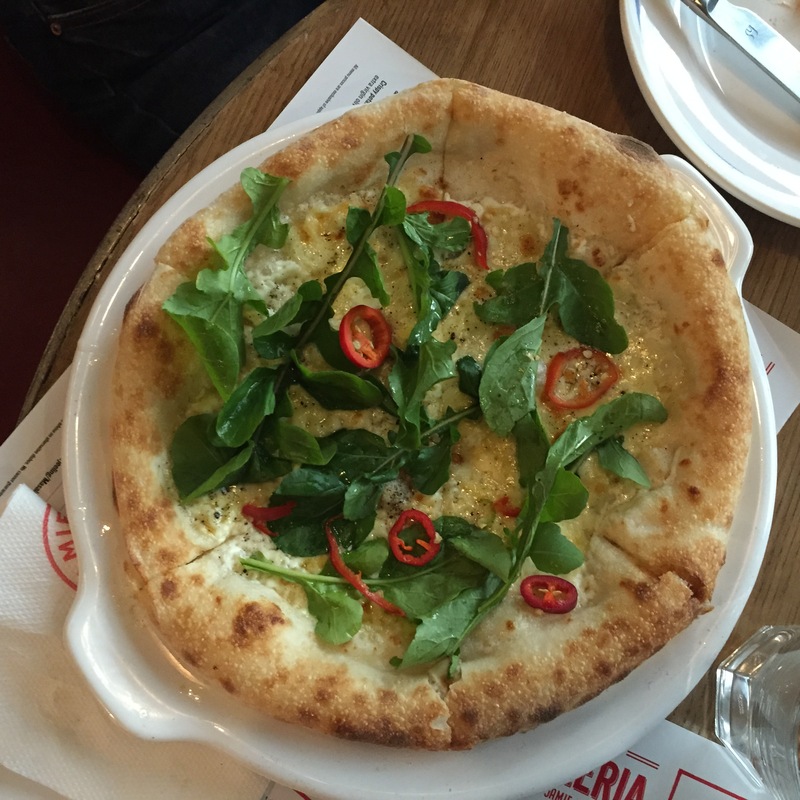 Take for example the Quattro Formaggi (Four Cheese) which transforms into The White Rocket – Mozzarella, mature Cheddar, Mascarpone, and Parmesan – with the addition of Rocket, to give it color, and red chilies to give that much needed kick. Surprisingly, it’s cheesy but not heavy at all and that liberal helping of olive oil adds a different chewy texture to the centre of the base as compared to the slightly crunchy sides. The favourite though was the Funghi Woodman with perfectly roasted wild mushrooms, Mozzarella, Parmesan and a gorgeous sub-taste thanks to the red onions, mint, and parsley. The fact that Jamie’s also has a Children’s Menu with a tiny, yet sufficient, Margherita meant I was actually able to try two different pizzas on top of this basic one that the kids insist on having. 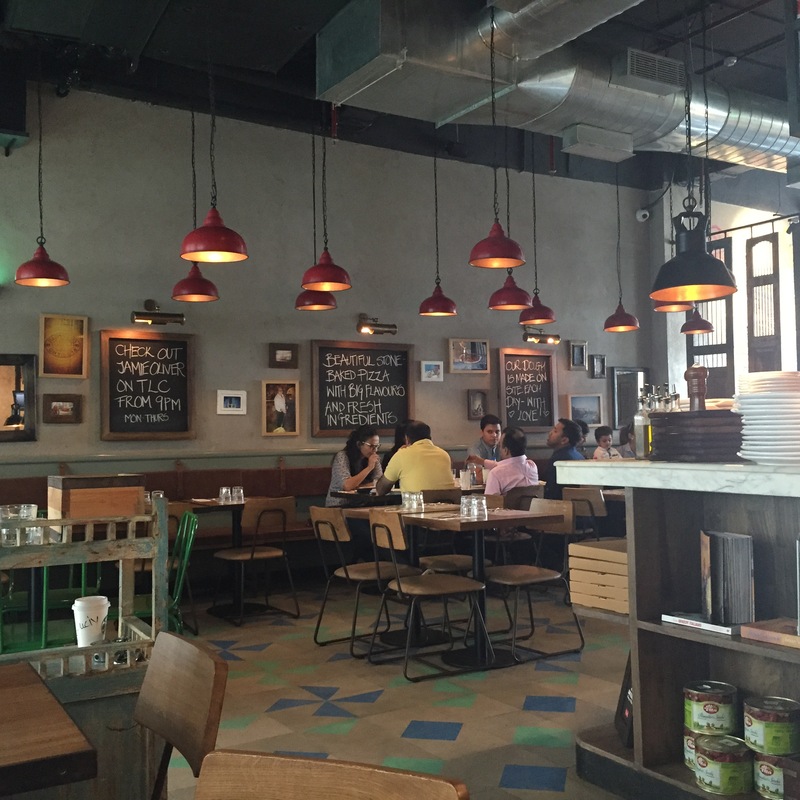 Jamie’s Pizzeria on the 3rd Floor of Ambiance Mall, Gurgaon has a very village-industrial look to it. It’s like a little restaurant – pizzeria – in a small town or village with wooden tables and simple decorations – mostly chalk boards – but the lighting and chairs are very in touch with the latest industrial interiors craze. The uncluttered look works, keeps the focus on the food and conversations are easy to come by. There’s a noticeable lack of condiments on tables – okay, not so notable for it didn’t strike me till I was half way through the second pizza – and I respect that. It shows confidence and guess what I didn’t miss the tomato ketchup, oregano, or the chili flakes. It was so refreshing not having them anywhere in sight and just relying on the taste of the pizza without having to add anything to it. By the way, I didn’t ask, so I’m not sure whether they serve these condiments on request or not. The service at Jamie’s Pizzeria is quite casual. There’s no constant “how’s the pizza” interruptions and while the place was relative full, the food didn’t take long to arrive. I did have to remind them for the drinks which didn’t come even after the meal was served, but it’s a minor issue and was taken care of instantly. Speaking of drinks, while the restaurant is still awaiting a license to serve alcohol, their Homemade Iced Tea was brilliant, in particular lacking the sugary manufactured taste that one gets from the powdered version. Everything in the end comes down to the freshness of the ingredients. 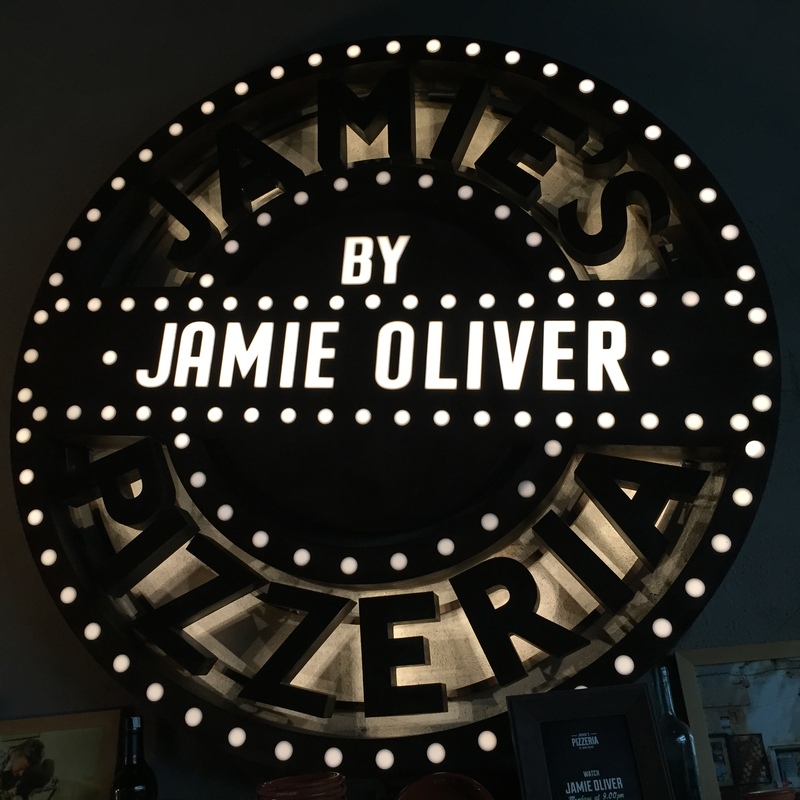 From the light recently made “hand-stretched” dough to the side salad in the children’s menu, to all the remaining ingredients, Jamie’s pizzas are now certainly among my favorites in the country. The simplicity of it all is wonderful and very true to what Jamie Oliver stands for as a culinary legend. And, at about Rs 1500,- for two and half vegetarian pizzas and a couple of non-alcoholic drinks, it’s not a bad deal at all. Cheers, and sorry about the late reply, for some reason your comment went into spam. I have to confess, I do like cheese and use it a lot, but the using the right amount as compared to loading it with that (unless it’s a “Cheesy Pizza” can take away from the other flavours.